In the last few days, I have heard credible people talk about the possibility of EMP attack against America. Author Bob Gleason, an expert on 2012, talked about his extensive research into post-nuclear apocalypse and how current events are aligning to provide a very real possibility of a nuclear event in the United States. It's very difficult to manufacture nuclear bomb fuel, but once you have it, "it's surprisingly easy to cobble together a group of Hiroshima-style nukes," particularly in the case of suicide bombers, who become the triggering mechanism themselves, he warned. A Hiroshima-type bomb would have the initial temperature of several million degrees, and create a fireball/blast wave that would destroy everything in a radius of one mile. "It leaves a kind of vacuum and everything gets sucked in," and is the one true weapon of mass destruction, he said. It could be difficult to trace the origin of a nuclear attack, he noted. One scenario, called "Catalytic Nuclear War," plays off of this. A "small vengeful power creates the illusion that one of the superpowers is nuking the nations of the Earth," and this could start a devastating nuclear war between two superpowers, he detailed. The Middle East remains a region of concern, and Gleason recommended getting free from dependence on foreign oil, because we're "bankrolling people who dislike us." He also cited nuclear energy plants as being problematic. He suspects that many nations keep or want such plants (which are not cost efficient over the long term), because they have the potential to contribute nuclear fuel for weapons. Without internet, telephones, cellphones, or even cars and trucks which couldbe affected by EMP pulse from above us, or electric power, people are just not ready for such a thing. So here is what we can do. Former policy analyst for the Dept. of Defense, and currently WND's Washington senior reporter, Michael Maloof, discussed how everything from our daily routines to our national defense will be crippled by an EMP attack, and why this is America's greatest threat to national security. An electromagnetic pulse (EMP) attack could come from either a serious solar storm (such as occurred in 1859) or a high-altitude nuclear explosion. This high intensity burst from super-charged particles can knock out or completely fry any unprotected electronics or electrical systems, he noted. The US' national grid system forms the basis for such crucial infrastructure as telecommunications and banking, and if it gets knocked out there would be cascading problems such as grocery stores running out of food, and the inability to access money or credit cards. "If we had a major intensive [solar] storm that had a direct hit on us, it could cost up to $2 trillion over four years to attempt to recover, and it would take us up to 10 years to recover," with some 160 million people seriously impacted in the United States, he reported. Yet, we could take remedial action now, to strengthen and protect the grid, but the problem is there's no one agency coordinating such efforts, Maloof said, and Congress has ignored its own commission report and shelved funding measures-- estimated to be between $20-50 billion to start fixing the problem. We need to create the position of an EMP Czar, someone under the National Security Council that can direct all activities from federal, state, and local governments to take decisive action, he continued, adding that the SHIELD Act should be reintroduced to the new Congress. Maloof also outlined EMP terror threats-- his biggest concern is over an attack instigated by a 'lone wolf' type, or a loose cannon state such as North Korea. Hurricane Irene hit the East Coast and left more than 6 million homes and businesses without power. Transportation services were disrupted as a result of the hurricane. More than a million people got an idea of what it would be like if the United States were attacked by an electromagnetic pulse (EMP) weapon. An EMP would cause current and voltage surges and burn out the semi-conductor chips of all electronic devices within the line of sight. An EMP is a high-intensity burst of electromagnetic energy caused by the rapid acceleration of charged particles caused by nuclear weapons, non-nuclear weapons (radio-frequency weapons), or geomagnetic storms (often called space weather). The most dangerous “EMP scenario” is a nuclear weapon attack. 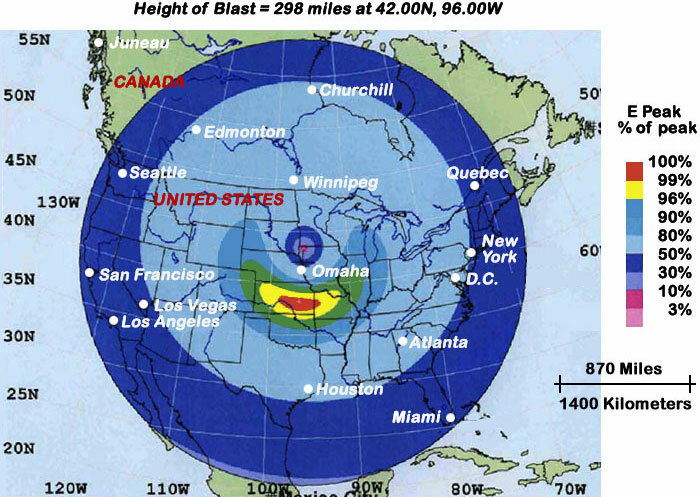 The higher the altitude of a nuclear weapon detonation, the larger the area that is impacted by the EMP. A single nuclear weapon has the potential to instantly send the United States back to the 19th century. Such an attack would likely cause millions of casualties, as basic elements necessary to sustain life in dense urban and suburban communities would not be available. Because the altitude of the detonation matters, the most effective delivery mechanism for an EMP weapon is a ballistic missile. From long-range missiles currently under development in North Korea and Iran—and already possessed by Russia and China—to short-range nuclear-tipped missiles launched from vessels, submarines, or container ships off the U.S. coast, the United States remains vulnerable to an EMP attack. To address this threat, it is essential to expand the ballistic missile protection of the U.S. homeland. A system better than the current one would be comprised of Aegis ballistic missile defense capable ships; Aegis Ashore, a land-based missile defense component; and Unmanned Aerial Vehicle capabilities. So far, the Obama Administration’s record is questionable. It has made massive cuts to the U.S. missile defense program and cancelled some of the most promising programs. In addition, for about $200 million, the United States can harden the major transformers close to major metropolitan areas. This relatively minor investment could save millions of American lives and should be appropriated despite the current fiscal constraints. This statement is commonly known as Clarke's Third Law. Many people have heard this quotation, but few people really think about its implications. We now live in a world that is so completely immersed in advanced technology that we depend upon it for our very survival. Most of the actions that we depend upon for our everyday activities -- from flipping a switch to make the lights come on to obtaining all of our food supplies at a nearby supermarket -- are things that any individual from a century ago would consider magic. Very few people in industrialized countries do work that is not directly assisted by electronic computers, although that computerized assistance is often quite invisible to the average person. Few people think about things such as the fact that whenever we buy some food item at a supermarket (and many others are buying the same item), the next time we go to that same supermarket, they still have about the same supplies that they had before. There are invisible infrastructures all around us that are made up of advanced technology. Most of us just take the magic for granted. Among all of the kinds of electromagnetic disturbances that can occur, though, it is important to keep things in perspective. It is possible that a nuclear EMP may never happen where you live. On the other hand, a severe solar storm that will destroy most of the world's power grids appears nearly inevitable at this point. Protection against the damage of a severe solar storm could be done easily and rather inexpensively by the electrical utilities; however it is not being done, and there is no sign that it will be done. A severe solar storm poses little threat to electronics, but would take down the most important power grids in the world for a period of years. This is a special problem in the United States, and is a severe threat in the eastern United States. So, more important than preparing for a nuclear EMP attack is preparing for all of the ramifications of a severe solar storm which would cause an electrical power outage that would, in most areas, last for a period of years. Most standby power systems would continue to function after a severe solar storm, but supplying the standby power systems with adequate fuel, when the main power grids are offline for years, could become a very critical problem. This is a page about some of the things that individuals can do to prepare for an electromagnetic pulse attack. I'm an electronics engineer who has been thinking about the EMP problem for more than 3 decades. I even have an ancient Radio Shack TRS-80 Model 4P that has been retrofitted with a complete electromagnetic shield. It's just a personal antique, useless for anything but a personal reminder of how long I've been thinking about this problem. That early-model personal computer didn't even have a hard drive. I've spent much of my career working with radio and television transmitters on high mountaintops where there is a lot of lightning and other kinds of severe electromagnetic transients. Many engineers who spend their careers working in fairly benign electromagnetic environments don't realize the fragility of our technological infrastructure. On this page, I'm going to concentrate on a nuclear EMP attack, but much of this also applies to natural events such as unusual geomagnetic storms due to extremely large solar storms. The threat of a sudden EMP attack that causes a widespread catastrophe is certainly nothing new. Consider this Cold War era quotation from a widely-read and highly-respected publication 30 years ago: "The United States is frequently crossed by picture-taking Cosmos series satellites that orbit at a height of 200 to 450 kilometers above the earth. Just one of these satellites, carrying a few pounds of enriched plutonium instead of a camera, might touch off instant coast-to-coast pandemonium: the U.S. power grid going out, all electrical appliances without a separate power supply (televisions, radios, computers, traffic lights) shutting down, commercial telephone lines going dead, special military channels barely working or quickly going silent." -- from "Nuclear Pulse (III): Playing a Wild Card" by William J. Broad in Science magazine, pages 1248-1251, June 12, 1981. First: Another brief note about severe solar storms (and similar natural events), and then I'll get back to nuclear EMP. Solar storms would primarily affect the power grid, and are not likely to harm things like computers. Also, solar storms would only disrupt communications temporarily, and would not be likely to cause direct harm to communications equipment (except for satellites). An extremely large solar storm, though, would induce geomagnetic currents that could destroy a substantial fraction of the very largest transformers on the power grid (possibly over much of the world). If this happened, electric power loss due to a large solar storm would be out for a period of years and possibly decades. Unlike nuclear EMP, such a solar storm is an eventual inevitability. The last solar storm that could have caused this level of damage happened in 1859, before the power grid was in place (although in 1921 a large solar storm, of briefer duration than the 1859 event, occurred which affected only a small area of the planet). The power grid has only been in place for a tiny fraction of one percent of human history, and a really large solar storm (of the size and duration of the 1859 event) has not happened in that time. There is a general assumption that any solar event that is similar to, or larger than, the 1859 solar superstorm will simply never happen again, although there is no justification for such an assumption -- in fact, we know that this assumption is false. There is a good possibility that such a solar storm will happen in this century. If it happens in the current situation without spares for our largest transformers, a large part of the worldwide power grid (including 70 to 100 percent of the United States power grid) will be down for years. A 2008 study by Metatech found that the time required to obtain a replacement for any one of the 370 or so largest transformers in the United States was 3 years. In a solar superstorm that affects vulnerable areas of the entire world, delivery times could easily be much longer. The United States, which currently has no capability to manufacture those transformers, will be at the end of a very long waiting line. There are some companies in the United States that certainly have the capability of moving up from the ability to manufacture medium-sized power grid transformers to the capability of manufacturing even the largest transformers. So far, that capability has not been developed. Since such a expansion of manufacturing capability requires a lot of electrical power, the capability cannot be developed after an electromagnetic catastrophe. The capability has to be developed before there is an actual critical need. In recent months, two companies have expressed the intention of getting back into the large transformer business, but it will take a considerable length of time to develop this capability fully. Because of the inevitability of a large solar superstorm, we have to accept the fact that the current electric power grid upon which our lives depend is only a temporary infrastructure. This temporary infrastructure has served us very well, and we now have entrusted our very lives to it. The electric power grid began as a convenience, but has become a necessity for sustaining life through a process that has happened so slowly that most of us have not noticed this transformation. We do not know how long the current power grid will last; but if it not replaced by a robust permanent infrastructure in time, hundreds of millions of people will die when the electric power grid collapses simultaneously in many countries. How such a collapse occurs is well known, and the methods to either prevent it, or to have spare transformers in place to fairly quickly repair it, are also well known. Although these preventive measures would not be terribly expensive, they would take some time to put into place, and those things have never been done. Provisions for insuring islands of power production within the country that would prevent millions of deaths could be put in place fairly quickly, and much less expensively, but this also has never been done -- or, until recently, even been seriously considered, except by the few scientists and engineers who have seriously studied the fragility of the electric power grid. There are finally signs, in 2011, that this situation is beginning to change. The most important piece of information you can have after any sort of unusual electrical event is information about what happened. If there is a bright flash in the sky at the same time that the power goes off, and you've been thinking about nuclear EMP, your first reaction may be to assume the worst It may, however, be just cloud-to-cloud lightning that happened at the same time that a distant cloud-to-ground lightning strike knocked out the power. Even if you thought the sky was clear outside, there may have been a distant thunderstorm, and lightning bolts sometimes travel remarkably long distances. If it is a nuclear EMP, though, you will want to know about it right away, and the local radio and television stations are going to all be off the air. The internet will also be down. There might be some telephone service if you are very lucky, but anyone that you would call probably won't know any more than you. The only way that you will get any timely information will be by listening to broadcasts originating on other continents using a battery-operated shortwave radio. Just adding many layers of foil directly on top of foil won't do as much good, due to what is called "skin effect." I won't bother to explain skin effect here, but you can look it up if you're curious. Don't worry too much about skin effect, though. I only mention it here because many people have the misconception that when it comes to shielding, the thicker the better -- and this is definitely not true after a certain thickness is reached. Layers of shielding separated by insulation works much better. As a practical matter, though, wrapping with 2 or 3 layers of foil helps to assure that you actually have a good shield around the equipment. One question that arises frequently is whether a gun safe or a galvanized trash can makes an effective faraday cage. Technically, it may not be correct to call either of these a faraday cage because they are not constructed of the best electrical conductors. A galvanized metal trash can, though, can be a very effective electromagnetic shield. The interior of the body of the galvanized metal trash can should be lined with some material to electrically insulate items stored inside the container from the metal exterior. (Cardboard probably works better than any other inexpensive material for this. Liners such as plastic trash bags may be too thin for this because of the momentary high voltages that could be induced on the exterior during an actual EMP.) Do not place any insulation at a point where it would interfere with the electrical connection between the metal lid and the metal body of the trash can. It would be a good idea to wrap items placed inside the metal trash can with a layer of aluminum foil in the "nested faraday cage manner described above. The question about using gun safes as an electromagnetic shield cannot be answered because there are so many variations in construction that would affect the shielding efficiency. In particular, the electrical connection between the door and the rest of the safe is usually not very good. Such a safe probably has some shielding effectiveness, but in most cases, the shielding is very minimal. You'll need to keep plenty of batteries on hand for your radios. There are some models of shortwave radios that have hand-crank or solar power, but those "emergency radios" that I've tried don't have very good shortwave reception (although, as explained below, many inexpensive shortwave radios could suddenly become very adequate after an EMP event). A common complaint about radios that use hand-crank power is that the hand cranks are not very sturdy, however the radios will continue to function by using conventional battery power (or solar power if it is available.) If you do use the hand crank on an emergency radio, though, do not treat the hand crank too roughly. I still recommend keeping plenty of batteries on hand. Energizer makes lithium batteries with a 15 year shelf life. Although small batteries were not damaged during the 1962 high-altitude nuclear tests, it would be wise to wrap each sealed package of batteries in a layer of aluminum foil. Future EMPs may be much larger than the 1962 events. Also, battery technology is evolving and the sensitivity of newer types of batteries to EMP is unknown (although the cylindrical batteries tend to provide a certain amount of shielding just due to the way that they are constructed.). I generally prefer Energizer batteries for cylindrical batteries (AA, AAA, C and D sizes) and Duracell for 9-volt batteries. The 9-volt batteries contain 6 internal cells in series. In the Duracell 9-volt batteries, the cells are spot welded together, whereas most other popular brands use a simple press-fit interconnect for the cells. The Duracell spot-weld method generally makes for a much more reliable connection in this type of battery. The idea behind having a shortwave radio is to be able to directly receive radio stations on another continent that has been unaffected by the EMP. The radio that I like best of the portable, and not too expensive, receivers is the SONY ICF-SW7600GR. This model is not cheap, but you can usually find it for at least 25 percent below its "list price." Another good shortwave radio for the price is the Grundig Traveller II Digital G8. This Grundig radio is much less expensive than the SONY ICF-SW7600GR. You can usually find the Grundig G8 for around 50 U.S. dollars. In using the Grundig radio recently, my only complaint was that it seemed to be much more susceptible to electrical noise than many other shortwave radios. Electrical noise is always a problem when listening to distant stations, but, of course, in a post-EMP situation, electrical noise would cease to be a problem. Grundig also makes a somewhat better radio known as the S350DL, that sells for about 100 U.S. dollars. This radio is larger, and many people find it easier to handle. It also has a number of features, such as bandwidth and RF gain controls, that are difficult to find on other radios in this price range. The tuning on the S350DL is analog, but it has a digital readout. Some of the annoying aspects of the tuning dial in earliest models of this radio have been corrected in current versions. The National Geographic Store sells the Grundig S350DL radio, which is pictured at the bottom of this page. Many people have legitimate complaints about nearly any shortwave radio that can be purchased for less than 300 U.S. dollars. Those complaints are often valid if the radio is to be used frequently in today's high levels of electrical noise and radio frequency interference. In a post-EMP situation, or any situation where the regional electric grid goes down, the situation will be very different. One important misconception about electromagnetic shielding is the common belief that it should be "all or nothing." When it comes to critical small spare items like an emergency radio, it is important to go to some extra trouble to insure the best shielding possible. Simple small nested faraday cages are so simple and inexpensive that you might as well make sure that a few items are very well shielded. When it comes to less critical items, though, such as items that you use frequently, a less-complete electromagnetic shield could easily make the difference between having equipment that survives an EMP and equipment that does not survive. It is a very common misconception that certain items must have military-grade shielding and other items are nothing to worry about at all. Real world electromagnetic disturbances are much more messy than that. A nuclear EMP will severely disrupt the upper atmosphere, so it could be several hours after an EMP before you get decent shortwave reception with any radio, but that will be long before you could get information from any other source. If you're in the United States, you may be able to get emergency information from a local NOAA Weather Radio station. I believe that a few NOAA emergency transmitters are EMP-protected, but most are not. Repairs to many of these transmitters may be able to be made by military personnel, who can also supply emergency power to them for a while, but that emergency power may not last very long. If you're in the United States, though, it is important to have a NOAA Weather Radio. These radios really are inexpensive, and whenever the NOAA transmitters are working, they can provide local information that is critically important. Like your shortwave radio, an emergency NOAA Weather radio needs to be kept in a nested faraday cage until you need it. NOAA Weather Radios could be especially important in the case of a large solar superstorm, where the radios would probably continue to work and give information, even though much of the power grid could be out for years. If you have a spare laptop computer, it can also be stored in nested faraday cages, just like your radio. LED and CFL lights: LED lights (and, to a lesser extent, compact fluorescent lights) can be very useful for post-EMP use because of their efficiency at a time when very little electricity may be available. Both LED lights and CFL lights, though, are very sensitive to EMP. LED lights are solid-state diodes that are made to conduct electricity on one direction only. In the case of LED lights, the LED itself has a very low reverse breakdown voltage. Most LED lights will handle a fairly large voltage spike in the forward direction, but not in the reverse direction. LED lights are currently the most efficient form of lighting that is available. LED lights also can last for a very long time. I know of one case where a device that I built in 1980 has some of the older (1970s) type of LED indicator lights that have been operating continuously for more than 30 years. Compact fluorescent lights can probably be stored without any kind of EMP protection because the base of the light is so small that they are unlikely to pick up enough voltage for the imbedded transistors to be damaged. CFL bulbs are almost certain, however, to be damaged if they are in a socket at the time of an EMP since they have two switching transistors embedded into the base of the CFL. These switching transistors, although they are out of sight, would very likely be damaged by high voltages picked up by any wiring external the the CFL device itself. If you learn that you have been in an EMP attack, don't make any premature assumptions about how bad it may have been. It may have just hit a part of the country, or it may have been with a relatively small weapon so that the power grid may be back up and running in a few weeks. It also could be from a large weapon, or multiple weapons, that totally destroyed the infrastructure of the country. There is an enormous spectrum of possibilities for an EMP attack. Much of what has been written elsewhere about faraday cages is based upon the assumption that the faraday cage is going to be a room or building sized structure. Large professionally-built faraday cages need to be well-grounded, but for smaller faraday cages, such as you would use to shield a radio or a laptop computer, any wire running to a ground is likely to just function as an antenna, and possibly as a very efficient antenna for gathering EMP. Grounding for EMP is a very specialized area of technology. In fact, grounding for just about any application other than simple static discharge or some basic kinds of electrical safety are also very specialized areas of technology. As the Soviets learned in 1962, even large underground conductors (such as underground power lines) can absorb huge induced currents from nuclear EMP. The same thing can happen to underground conductors like cold water pipes, which are commonly used for more primitive types of grounding. In a nuclear EMP, a cold water pipe ground may become a large underground antenna if it is connected to a long underground pipe. Although these underground pipes probably won't pick up very much of the fast E1 pulse, they can pick up rather large DC-like currents, and you don't need unexpected electrical currents coming from what you thought was a ground connection. A few days after an EMP attack, a lot of people will become really terrified as their food and water supplies run out, and they discover that there is no way to obtain fresh supplies. Within two or three weeks, the military services will likely come to the rescue for many people. If the size of the attack has been very large, though, that period of relief will probably not last very long. An even larger problem for food distribution is that any kind of centrally-directed distribution, no matter how well-intentioned, is highly inefficient. If you drive into any very large city with enough food for everyone, no centralized organization has ever figured out how to devise a mechanism that is anything close to being as efficient as the marketplace to get the food to everyone. In any case, most people will soon simply begin to starve to death. For many people, their first concern regarding an EMP attack or a solar superstorm is the protection of their personal electronics, or even their automobiles. For nearly everyone, though, the first real problem they will face will come from the loss of power to the pumps that supply their water -- and with the computers that maintain the only local food supplies. Although most individuals cannot do anything to protect critical infrastructure computers or to protect the power to critical central utility water pumps, some advanced planning can increase the chances that you will have an adequate supply of food and water. Whatever the scope of the EMP attack, the longer that you can remain at home and be fairly self-sufficient, the better things will be for you. This is likely to be especially true during the first few weeks after the EMP event. In most industrialized countries, it is not customary for individuals to keep very much in the way of emergency supplies in their homes. In fact, many people who do keep many emergency supplies are regarded with some suspicion, thought to be "survivalists" or some other strange breed of humans. Disasters are frequent enough, though, that any prudent individual should maintain some basic level of self-sufficiency. Most people in industrialized countries see large-scale emergencies happening frequently on television, while maintaining the irrational and completely unwarranted assumption that it will never happen to them. It is the people who do not plan for personal emergencies who ought to be regarded with suspicion as a strange and irrational breed of human. There are several very reliable companies that specialize in these emergency supplies. The MREs (meals ready to eat) used by military services, especially during emergencies, have to be made on an industrial scale, and they are available for sale to individuals during non-emergency times. The MREs are not the best choice for emergency supplies, though, because of the limited lifetime compared to canned dehydrated and canned freeze-dried food. Many of these same companies that make MREs also make freeze-dried food in cans, which have a far longer shelf life and a much lower daily relative cost. After any sort of large-scale disaster, these supplies are only going to be available from government agencies, and government agencies will only have a finite supply. Many basic emergency supplies can be purchased in advance of the emergency from reputable companies that have been making these emergency food supplies for years. The food that these companies sell normally has a shelf life of 5 to 25 years or more, depending upon exactly how it is prepared and packaged. Although I do not want to get into the process of naming companies, one that I believe to be one of the best, especially for those who have not thought about the subject before, is Emergency Essentials. For any emergency food supplies that you do get, it is important to get food that you personally like and are actually likely to use, even if a personal emergency never happens. Then, if an emergency does happen, it will be you, not distant relief workers, who will determine what the content of your food supply is. If you get food that you actually like, you will be motivated to actually use it, and you won't have to throw it out as it approaches its maximum storable life. Some people keep only grains as an emergency food supply. Although some raw grains have a very long shelf life and a high calorie density, they do not have an adequate spectrum of nutrients for long-term use. In any emergency situation where scarcity of food is a long-term problem, we are likely to see the return of long-forgotten nutritional diseases such as scurvy and various kinds of other vitamin deficiencies, especially of the B vitamins and vitamin D.
Don't forget about water. Few people keep an emergency supply of water, in spite of the fact that it is inexpensive and easy to do. Almost every country of the world has a period of days every year where many people in some large area are without drinkable water. In most countries, much of the water is pumped by electric motors. After a major EMP attack or a solar superstorm, electricity for most of those pumps is going to be unavailable for a very long period of time. It would be easy for most cities to have a protected emergency electrical supply in place for critical pumps; but, like most EMP protection activity, although it is easy and could possibly save millions of lives, it is not being done. A good source of information and products in a situation where the electric grid is down, especially for obtaining well water in such a situation, is the Lehmans web site. It is also a good idea to have plenty of fire extinguishers. The immediate aftermath of either a nuclear EMP attack or a large solar superstorm is likely result in a number of fires, along with the elimination of the water necessary to extinguish the fires. Both the E3 component of a nuclear electromagnetic pulse, as well as the DC-like currents induced by a large solar superstorm, are likely to overheat thousands of transformers that are connected to long wires. Although it is the destruction of the very large transformers in the power grid that could keep the power grid from being restored for many years, many much smaller transformers, such as those on utility poles, and spread throughout suburban neighborhoods, are at risk of overheating to the point that they cause fires. Although the great majority of the smaller transformers are likely to survive, many of these transformers are very old, and some of them are likely to severely overheat. Medicine is another very important thing that must be considered. If there are medicines that are required by someone in your household, it is always prudent to have an extra supply on hand. In many countries, insurance restricts the amount of medicine that you can buy. It is often actually less expensive to pay the full price for prescription medicine, especially when generics are available. Buying prescription medicine out of your own pocket makes it much easier to stockpile a supply for emergencies. There is a fairly new web site operated by a physician that discusses the problem of medicine storage for use during disasters. See the Armageddon Medicine site. If you want to really be part of the solution, instead of part of the problem, and increase the probability that the country can return to normal within a few years after an EMP attack, then you can be prepared to become part of the new infrastructure. The more electronics equipment that you can store under nested faraday shielding, the better. If you want to be able to use that electronics equipment after the batteries run down, you will need a personal power source. A simple small electric generator, one that does not depend upon electronics to start or run, is always a good idea. After an EMP attack, though, fuel for the generator will be a scarce commodity. Solar panels can be used to supply a small amount of electricity indefinitely, especially if you also have some good rechargeable batteries that match the voltage of your solar panel. I don't know how resistant solar cells are to EMP (the solar panel technology is ever-changing), but if you have something like a 50 watt solar panel, you can store it in a nested faraday cage. Only very rare individuals are going to be able to have full electric power after an EMP attack, no matter what advance preparations they might like to make. In a post-pulse world, though, any amount of reasonably reliable electricity is going to be a real personal luxury. If you have solar panels that are now in use, you can obtain some EMP protection by proper shielding and transient protection on the wires going to the panels, and by surrounding the panels with aluminum wire cloth (also known as hardware cloth). Aluminum wire cloth is somewhat difficult to find, but it is available. Aluminum wire cloth with openings of 0.4 to 0.5 inches will not only supply a certain amount of EMP protection, but can provide some protection against larger hailstones that can cause damage in severe weather. The wire cloth will block some of the sunlight, but the right size of wire cloth will block less than 15 to 25 percent of the sunlight. If you are making a new solar panel system, some consideration should be given to putting the solar panels inside of a cage made of aluminum wire cloth. This is much easier to do during the original installation. If you plan to use solar cells or battery power, you will probably want to keep a small inverter under shielding. Inverters that can step up ordinary 12 volt DC power to a few hundred watts of household AC are not terribly expensive. For people who own protected photovoltaic solar cells, a number of DC-powered appliances have recently become available. Transient protection (capable of reacting to the fast E1 pulse) must be supplied on the electronic components of any solar cell system, such as the inputs and outputs of charge controllers and inverters. Any wire runs of any length should be shielded. If you're trying to protect an existing solar panel system, protecting the wiring (even if it is shielded) from transients will require the services of someone knowledgeable in EMP transient protection. In most cases, the most economical solution is to keep spare components, especially inverters and charge controllers, stored under electromagnetic shielding. If you do have access to post-EMP electricity sufficient to run a microwave oven occasionally, that can be a very efficient way of cooking food in many situations. The problem is that most microwave ovens couldn't be turned on after an EMP event due to the sensitivity of the solid-state control circuitry. The magnetron that generates the heat in a microwave oven would probably survive an EMP just fine. Microwave ovens are heavily shielded, but the sensitive control circuits are outside of the shielding. A few microwave ovens are controlled by a mechanical timer, and these would probably be fully functional after an EMP (assuming that you can occasionally get enough electricity to operate them). You can still find mechanical-timer-controlled microwave ovens occasionally, although they are getting harder to find every year. I bought one about four years ago at K-Mart for $40 for post-EMP use. I have recently seen small microwave ovens with electro-mechanical controls come back onto the market. Laptop computers are generally much easier to protect from EMP than desktop computers. This is true both because of the smaller size of laptop computers and the fact that desktop computers have numerous cables which act as antennas for EMP -- and which conduct the pulse directly to the very sensitive electronics inside the computer. Even laptop computers must be well-shielded and without any connections to unprotected wires. The U.S. military contractors have developed shielding devices so that laptop computers can continue to be used during EMP attacks. Devices such as these, however, are not available on the commercial market. If you want to store larger items in a faraday cage, you can use copper screen or aluminum screen. Most commercial faraday cages use copper screen, but copper screen is expensive and is difficult for most individuals to obtain. Bright aluminum screen works almost as well, and aluminum screen can be obtained in rolls at many building supply stores such as Home Depot. Don't worry about the fact that this screen is not a solid material. The size of the tiny ventilation holes in the mesh of ordinary window screen is irrelevant to EMP protection. Aluminum screen can make a very effective electromagnetic shield. Ordinary ferrous (iron-containing) window screen is not a good material for a faraday cage because it is a poor electrical conductor. Do keep in mind, though, that anything even approaching a room-sized faraday cage is likely to only be a partial shield unless it is carefully and professionally designed and maintained, something that is completely impractical for most individuals. A partial shield, though, can often reduce electromagnetic signals from the outside by a critical amount. When I was working at a broadcast transmitter site that had an unacceptable level of electromagnetic radiation from the FM broadcast antenna into the area at ground level where the vehicle was commonly parked, I had a carport built with copper screen imbedded into the roof of the carport. The reduction in electromagnetic radiation beneath the carport was quite dramatic -- as actually measured using professional equipment. Since nuclear EMP comes in from a fairly high angle, it is likely that a similar arrangement, but using aluminum screen, would reduce the EMP substantially, possibly enough to protect vehicles and other large items stored below the shielded structure. In the case of the carport that I had built, I grounded the imbedded screen because I knew that the wire leading to ground would not act as more of an antenna than a ground for the shield. (I also knew that the ground at the bottom of the carport was an extremely well-designed ground.) Although most small faraday cages should not be grounded because of the "accidental antenna" problem, if a carport shield can be well-grounded at all four corners, then a direct wire going to a ground rod at each corner would probably be a good idea. One question that most people don't think about is how to test the shielding efficiency that you are using. Most people don't have access to professional electromagnetic field measuring equipment, and they certainly don't have any nuclear weapons laying around the house. The most damaging part of a nuclear EMP has frequency components that run roughly from the AM broadcast band to the FM broadcast band. The components that are most likely to damage ordinary small electronic items are near the FM broadcast band. Therefore, you can make a rough test of your shielding effectiveness by tuning a radio to a strong FM station and see if your shielding silences the radio so that you can't receive the FM station. You can try the same thing with AM. In general, the good electrical conductors like copper or aluminum will be better at shielding the higher frequencies in the FM range, while steel cases may perform better in the lower-frequency AM band. It is important to have all of the computer data that is important to you backed up onto optical media, like CD or DVD. Paper printouts are fine, but after an EMP attack, most of the data on paper printouts will simply never get typed back into computers, so those paper printouts will just become your personal mementos. CD and DVD data (in other words, optical media) is not affected by EMP. Even if your computers are destroyed, if the country's economy can get re-built after an EMP attack, then new computers can be purchased from other continents. If all the computer data is gone, then recovery is going to be many years later than it would be if the data could just be reloaded from optical media. Computer data runs our modern world. It is a major part of the invisible magic that I mentioned at the top of this page. If you own a small business, that computer data can be especially important. (It is probably not a good idea to use double-sided DVDs, though, since there is the possibility of arcing between layers during electronic attacks. It is best to just use single-sided single-layer media.) For long-term storage of data, archival grade CD-R and DVD-R media are available at a reasonable price from manufacturers such as Verbatim and Memorex. The archival grade media are much more likely to last for many years or decades, and they don't cost that much more than standard media. Most stores don't carry archival grade media, but they aren't that difficult to find, especially on larger electronics stores on the internet. Protecting most of the electronic appliances in your house against EMP, if they are plugged in and in use, is probably hopeless. There is always the possibility, though, that you will be near the edge of an area that is affected by an EMP attack. For this possibility, the combination of ordinary surge suppressors and ferrite suppression cores could be very valuable. There is at least one company that makes surge suppressors that look much like ordinary retail store surge suppressors, that are designed to be fast enough for nuclear EMP. Ferrite suppression cores are those imbedded cylindrical things that make the cylindrical protrusion in the power cords on sensitive electronics equipment. They can be very effective to protect your equipment against ordinary transients -- such as the type that occur constantly on the power lines and slowly damage your electronics equipment. The ferrite suppressors on power cords (and inside of many surge protectors) are usually the common type 43 ferrite material, which offers a considerable amount of protection against ordinary transients, but would do only a little to protect against the very fast E1 component of a nuclear EMP. You can buy separate snap-on ferrite suppressors, including snap-on ferrite suppression cores with type 61 ferrite, which will absorb much faster pulses. The ferrite cores with material 61 don't cost all that much more than the older ferrite, and they should attenuate the spike from a nuclear EMP much better than type 43 material. If you're in an area where there is a strong EMP, it won't attenuate it enough to do any good at all, but if you're at the edge of the affected area, or just get a nearby lightning strike, or have a lot of ordinary voltage spikes on your power line, these snap-on ferrite cores with material 61 could be extremely valuable. They are sold by companies such as Mouser Electronics. Look for items such as Fair-Rite part number 0461167281 or 0461164281. There are all kinds of EMP attack scenarios. There are many situations one can imagine where the area around the edges of the EMP zone is extremely large. There could be entire large cities where even the unshielded equipment with minimal protection mostly survives, but everything unprotected is fried. There is actually quite a lot that can be done to protect your electronics from a small EMP attack or if you happen to be at the edge of the EMP-affected area. If you live in a lightning-prone area, many of these things will give your electronics equipment a much longer lifetime. Repeated hits from small electrical transients is a major cause of electronic failures, ranking second only to heat as a cause of most types of electronic failure. It is important to read the EMP Commission Report on Critical National Infrastructures, so you'll have some idea of the scope of the EMP problem. Note: This is a 200-page report (7 megabytes), and could take a half-hour or more to download if you are on a slow dial-up connection. This EMP Commission report is the best information, but definitely not the last word, on likely EMP effects on today's infrastructure and equipment. The EMP Commission relied heavily on data from simulators, and this data does not explain all of the effects that were actually seen in the 1962 nuclear tests, especially in the Soviet EMP tests over Kazakhstan. One thing that you'll discover in that Critical National Infrastructures Report is that automobiles and trucks seem to be more resilient against EMP attacks that what is portrayed in most fiction. Although many vehicles would be rendered inoperative, and it will be a regular "demolition derby" on streets and highways, many (but not all) vehicles that are not running at the time of an EMP will be likely to run after they are started (although there is a very high probability that your car will experience electronic damage outside of the electronic ignition system, and your car may have to be started in an unconventional way. It is also possible that you may have to momentarily disconnect the battery so that electronic modules can recover from an EMP-caused latch-up condition, a situation unique to EMP.) It may be necessary to have a maintenance manual for your car so that you, or someone you know, can figure out how to bypass the damaged modules in your car. Vehicles, especially gasoline vehicles, have to have a robust amount of electromagnetic shielding around the entire electronic ignition system. Otherwise, the ignition noise from all the automobiles would render radio and television sets unusable (especially car radios). Today's automobiles have published standards for electromagnetic shielding, but there is not much consistency in shielding requirements. You can check this list from Clemson University for a partial list of the many and varied standards for electromagnetic shielding of automobiles. Some additional information on vehicles may be found on the EMP Effects on Vehicles Page. The most difficult part of operating a car after an EMP event (or even a solar superstorm) is likely to be obtaining gasoline. It is very foolish to ever let the level of gasoline in your tank get below half full. In a wide range of emergencies, one of the most valuable things to have is a full tank of gasoline. A solar superstorm will NOT damage your automobile; but by knocking out the power grid, it can make fuel almost impossible to find. It is important to remember that the last time an automobile was actually tested against nuclear EMP was in 1962. Everything since then has been in simulators that we hope are close to the real thing. One common question people ask is about grounding the frames of cars. If you have a car parked in a location where there is a very short and direct connection straight down into a high-quality ground, then grounding the frame of a car might help, but I doubt it. In most situations, attempts to ground the frame of a car are more likely to just make matters worse by providing an accidental antenna for EMP. The safest way to provide a modest amount of EMP protection for a car is to keep it parked inside a metal shed. Retrofitting an automobile to make it EMP-resistant is a project that would be too difficult and expensive for most people. For those who want to try, the only authoritative document that I know to be available is one called "EMP Mitigation - Protecting Land Mobile Vehicles from HEMP Threat Environment" which was just published in March, 2011. To find this document, go to the Protection Technology Group page, then click on the Knowledge Base link at the top of the page. Scroll down on the Knowledge Base page until you get to the article that you want. The article specifically applies to military vehicles, but has relevance to commercial vehicles as well. Note that the part of the referenced article that refers to bonding of "all metallic structures to a single point ground system" is referring to an electrical chassis ground on the vehicle, not to an earth ground. I highly recommend any of the articles on the Protection Technology Group Knowledge Base page as an excellent source of information about EMP and/or lightning protection. This should be a warning to anyone who is planning to use any very old vehicle for possible use after an EMP event. If you have a pre-electronic-ignition era vehicle, it is important that you also have an electrical wiring diagram for the vehicle, and plenty of fuses (and I do mean plenty of fuses) and some critical electrical spare parts. My own personal experience in maintaining a 1959 model RCA high-power television transmitter until the year 2000 tells me that it is very easy for high voltages to punch through old insulation. Although post-EMP repair of these older vehicles may be easier than repair of a modern vehicle, it can be very frustrating, since very old insulation on electrical wiring can become extremely brittle. If you are constructing any kind of EMP protection that does need a ground connection, make sure that it is a good-quality ground. If the soil is dry, rocky, or otherwise likely to be of poor conductivity, proprietary commercial grounding compounds are available to enhance the conductivity of your ground rod to the earth. Bentonite is a material that is widely used in drilling industries that can also greatly enhance conductivity between the grounding system and the earth. I have found bentonite to be very effective as a grounding material. For most people, bentonite is easier to obtain and much more practical than the proprietary commercial grounding compounds. If it is not feasible to bury a ground rod vertically, a fairly good ground can be made by digging a trench as long and deep as is feasible, then placing flexible copper tubing (such as is used in plumbing) in the trench, covering the copper tubing with bentonite or other grounding compound, covering with topsoil, then using the above-ground part of the copper tubing for the ground connection. One very effective means for isolating disturbances on the power line from electronics equipment is the use of a "double-conversion" type of "true online" UPS (uninterruptable power supply). Any very large E1 pulse coming in on the power line would destroy the UPS, but the UPS would have isolated the equipment from the power line transient before failing. It is important to note that most uninterruptable power supplies on the market are NOT the "true online" type, and are of very limited usefulness for isolating the equipment from the power line (even for ordinary voltage spikes). Most inexpensive uninterruptable power supplies let much of the voltage spike hit the equipment before switching to internal battery power after the AC line power has failed. The true online UPS units can also isolate equipment from the effects of the solar-storm-like E3 pulse or the effects of an actual solar superstorm. Although the principal effects of E3-type events for the individual is total loss of power from the power grid, these events could cause extreme distortions in the AC power waveform for a short amount of time until the grid collapses. This extremely-distorted AC could burn out motors and damage electrical and electronics equipment in a very short amount of time unless measures are taken to isolate the equipment from the power line by using a true online UPS or a ferro-resonant transformer. Certain types of ferro-resonant transformers, such as the SOLA CVS series, can isolate equipment from power line distortions by insuring that the equipment gets either a pure sine wave or nothing at all. The SOLA CVS transformers are also extremely effective at blocking most voltage transients from getting into equipment, although they won't completely block extremely large and fast transients such as those from the fast E1 component of a nuclear EMP. One very important consideration for anyone using a UPS or a ferro-resonant transformer for protection any equipment containing a motor of any size (even a refrigerator) is that motors have very high start-up currents, and neither UPS units nor ferro-resonant transformers are designed for motor operation. If you are trying to use either a UPS or a ferro-resonant transformer to protect any appliance where a motor is a significant part of the load, you have to select a UPS or ferro-resonant transformer that has several times the rated load of the appliance. Because electronics equipment is becoming more vulnerable to voltage transients all the time, the surge suppressors that are sold for protecting expensive consumer electronics are getting better all the time. Today's consumer AC plug-in transient suppressors are much faster than those sold just a two or three years ago, and many of the newer units will absorb much larger voltage spikes. Although none of the consumer-type surge protection devices are likely to be completely effective against EMP, they may be helpful in protecting some types of household appliances. If you have a small business with too much critical data to routinely back up onto optical media, you should consider looking for a data center with EMP protection and plenty of backup power. Many data centers are actually quite fragile, and many have proven to lack even the ability to survive a severe rain storm. Some data centers occupy former military facilities and claim to be EMP-hardened. You may want to consider backup data centers such as Infobunker and Cyberbunker. For anyone with two-way radio equipment or radio receivers that are already extremely well-shielded and also well isolated from the power line, but left with the vulnerability of a connection to an external antenna, EMP protection devices can be obtained that are made by Polyphaser. The Polyphaser EMP protection devices for antenna connections generally use only type N connectors (so you may need an adapter), and the cost is generally about $125. Polyphaser does not sell these devices directly to the customer in small quantities, but they can be purchased through companies such as Richardson Electronics if you know exactly what model number of Polyphaser device that you want. For conveniently protecting small electronics, such as laptop computers, when they are not in use, an aluminum briefcase should be very useful, but there are large differences in the shielding ability among different metallic briefcases. First, the briefcase needs to be a solid metal aluminum briefcase (not the less expensive "aluminum briefcase" that is actually made largely of aluminum-colored plastic). (The aluminum-colored plastic briefcases are useless as an EMP shield unless a considerable amount of additional electromagnetic shielding is added.) If you are unsure of the electromagnetic integrity of your aluminum briefcase, a layer of electromagnetically shielding metallic spray paint can be added to the exterior of the briefcase. The cans of electromagnetically shielding spray paint tend to be rather expensive, but they can be purchased from companies such as Mouser Electronics. For maximum effectiveness, there needs to be good electrical contact between the two halves of the briefcase, especially at the hinges and the latches. A well-shielded briefcase should be able to completely eliminate reception of an FM radio receiver that is tuned to a strong FM station and placed inside the briefcase with the latches secured. Many lessons about what to expect after an electromagnetic event can be learned from the aftermath of the March 2011 tsunami in Japan. Unfortunately, the information about these events after the initial earthquake and tsunami by the news media in the United States has ranged from horrible to non-existent. Nearly all of the deaths and suffering after the first hour of the tsunami have been due to the absence of electricity and electronic communications. Just about the only place to get accurate information about the aftermath of the tsunami is from NHK World. NHK has shown things like what happens when you try to open the grocery stores after power is restored after a prolonged outage, and the difficulties of supplying the grocery stores from the food warehouses when the inventory control and computerized ordering systems are not working. It should also be noted that the problems experienced in Japan by certain nuclear power plants are likely to be serious problems for any country in the aftermath of a severe solar storm or nuclear EMP. This has been discussed in connection with EMP long before the tsumani in Japan. Nuclear reactors require a reliable external source of electricity for cooling systems after any sort of scram shutdown. The aftermath of the 2011 tornados in the United States has exposed the vulnerability of the cellular telephone system. Most cell phones are too small to intercept enough EMP to damage them; but the cellular repeaters, which are necessary to the operation of the cellular telephone system, are very vulnerable in a wide range of disaster situations. Unfortunately, the cellular telephone system was not designed with any peer-to-peer (direct cell-phone-to-cell-phone) capability. This means that if the cellular repeater stations go down, your cell phone becomes useless. Some cellular telephone companies have developed mobile repeater stations for use in disaster situations. These have proven themselves to be mostly for show, and useless in any real-life large-scale emergency situation. Your personal EMP and solar storm protection plan is likely to be very different depending upon where you live, and how many other people live with you. The only way to make an effective plan is to try to imagine an unpleasant future where you are suddenly thrust back into the middle ages. One thing that an EMP or a severe solar storm won't destroy is the knowledge of how to re-build effectively. Hopefully, even if we don't get an robust and permanent infrastructure built in time to prevent a catastrophe, the rebuilt post-pulse electrical and electronic infrastructure will be something that is permanent, and that all of us can finally trust, unlike the very fragile infrastructure that we have today. EMP. The letters spell burnt out computers and other electrical systems and perhaps even a return to the dark ages if it were to mark the beginning of a nuclear war. But it doesn't need to be that way. Once you understand EMP, you can take a few simple precautions to protect yourself and equipment from it. In fact, you can enjoy much of the "high tech" life style you've come accustomed to even after the use of a nuclear device has been used by terrorists—or there is an all-out WWIII. EMP (Electro-Magnetic Pulse), also sometimes known as "NEMP" (Nuclear Electromagnetic Pulse), was kept secret from the public for a long time and was first discovered more or less by accident when US Military tests of nuclear weapons started knocking out phone banks and other equipment miles from ground zero. EMP is no longer "top secret" but information about it is still a little sketchy and hard to come by. Adding to the problems is the fact that its effects are hard to predict; even electronics designers have to test their equipment in powerful EMP simulators before they can be sure it is really capable of with standing the effect. EMP occurs with all nuclear explosions. With smaller explosions the effects are less pronounced. Nuclear bursts close to the ground are dampened by the earth so that EMP effects are more or less confined to the region of the blast and heat wave. But EMP becomes more pronounced and wide spread as the size and altitude of a nuclear blast is increased since the ground; of these two, altitude is the quickest way to produce greater EMP effects. As a nuclear device is exploded higher up, the earth soaks up fewer of the free electrons produced before they can travel some distance. Tactically, a space-based nuclear attack has a lot going for it; the magnetic field of the earth tends to spread out EMP so much that just one 20-MT bomb exploded at an altitude of 200 miles could—in theory—blanket the continental US with the effects of EMP. It's believed that the electrical surge of the EMP from such an explosion would be strong enough to knock out much of the civilian electrical equipment over the whole country. Certainly this is a lot of "bang for the buck" and it would be foolish to think that a nuclear attack would be launched without taking advantage of the confusion a high-altitude explosion could create. Ditto with its use by terrorists should the technology to get such payloads into space become readily available to smaller countries and groups. But there's no need for you to go back to the stone age if a nuclear war occurs. It is possible to avoid much of the EMP damage that could be done to electrical equipment—including the computer that brought this article to you—with just a few simple precautions. First of all, it's necessary to get rid of a few erroneous facts, however. One mistaken idea is that EMP is like a powerful bolt of lightning. While the two are alike in their end results—burning out electrical equipment with intense electronic surges—EMP is actually more akin to a super-powerful radio wave. Thus, strategies based on using lightning arrestors or lightning-rod grounding techniques are destined to failure in protecting equipment from EMP. Another false concept is that EMP "out of the blue" will fry your brain and/or body the way lightning strikes do. In the levels created by a nuclear weapon, it would not pose a health hazard to plants, animals, or man PROVIDED it isn't concentrated. This concentration of EMP by metal wiring is one reason that most electrical equipment and telephones would be destroyed by the electrical surge. It isn't that the equipment itself is really all that sensitive, but that the surge would be so concentrated that nothing working on low levels of electricity would survive. Protecting electrical equipment is simple if it can be unplugged from AC outlets, phone systems, or long antennas. But that assumes that you won't be using it when the EMP strikes. That isn't all that practical and—if a nuclear war were drawn out or an attack occurred in waves spread over hours or days— you'd have to either risk damage to equipment or do without it until things had settled down for sure. One simple solution is to use battery-operated equipment which has cords or antennas of only 30 inches or less in length. This short stretch of metal puts the device within the troughs of the nuclear-generated EMP wave and will keep the equipment from getting a damaging concentration of electrons. Provided the equipment isn't operated close to some other metal object (i.e., within 8 feet of a metal girder, telephone line, etc. ), it should survive without any other precautions being taken with it. If you don't want to buy a wealth of batteries for every appliance you own or use a radio set up with longer than 30-inch antenna, then you'll need to use equipment that is "hardened" against EMP. The trick is that it must REALLY be hardened from the real thing, not just EMP-proof on paper. This isn't all that easy. The National Academy of Sciences recently stated that tailored hardening is "not only deceptively difficult, but also very poorly understood by the defence-electronics community." Even the US Military has equipment which might not survive a nuclear attack, even though it is designed to do just that. That said, there are some methods which will help to protect circuits from EMP and give you an edge if you must operate ham radios or the like when a nuclear attack occurs. Design considerations include the use of tree formation circuits (rather than standard loop formations); the use of induction shielding around components; the use of self-contained battery packs; the use of loop antennas; and (with solid-state components) the use of Zener diodes. These design elements can eliminate the chance an EMP surge from power lines or long antennas damaging your equipment. Another useful strategy is to use grounding wires for each separate instrument which is coupled into a system so that EMP has more paths to take in grounding itself. A new device which may soon be on the market holds promise in allowing electronic equipment to be EMP hardened. Called the "Ovonic threshold device", it has been created by Energy Conversion Devices of Troy, MI. The Ovonic threshold device is a solid-state switch capable of quickly opening a path to ground when a circuit receives a massive surge of EMP. Use of this or a similar device would assure survival of equipment during a massive surge of electricity. Some electrical equipment is innately EMP-resistant. This includes large electric motors, vacuum tube equipment, electrical generators, transformers, relays, and the like. These might even survive a massive surge of EMP and would likely to survive if a few of the above precautions were taking in their design and deployment. At the other end of the scale of EMP resistance are some really sensitive electrical parts. These include IC circuits, microwave transistors, and Field Effect Transistors (FET's). If you have electrical equipment with such components, it must be very well protected if it is to survive EMP. One "survival system" for such sensitive equipment is the Faraday box. A Faraday box is simply a metal box designed to divert and soak up the EMP. If the object placed in the box is insulated from the inside surface of the box, it will not be affected by the EMP travelling around the outside metal surface of the box. The Faraday box simple and cheap and often provides more protection to electrical components than "hardening" through circuit designs which can't be (or haven't been) adequately tested. Many containers are suitable for make-shift Faraday boxes: cake boxes, ammunition containers, metal filing cabinets, etc., etc., can all be used. Despite what you may have read or heard, these boxes do NOT have to be airtight due to the long wave length of EMP; boxes can be made of wire screen or other porous metal. (2) the metal shield is continuous without any gaps between pieces or extra-large holes in it. Grounding a Faraday box is NOT necessary and in some cases actually may be less than ideal. While EMP and lightning aren't the "same animal", a good example of how lack of grounding is a plus can be seen with some types of lightning strikes. Take, for example, a lightning strike on a flying airplane. The strike doesn't fry the plane's occupants because the metal shell of the plane is a Faraday box of sorts. Even though the plane, high over the earth, isn't grounded it will sustain little damage. The thickness of the metal shield around the Faraday box isn't of much concern, either. This makes it possible to build protection "on the cheap" by simply using the cardboard packing box that equipment comes in along with aluminium foil. Just wrap the box with the aluminium foil (other metal foil or metal screen will also work); tape the foil in place and you're done. Provided it is kept dry, the cardboard will insulate the gear inside it from the foil; placing the foil-wrapped box inside a larger cardboard box is also wise to be sure the foil isn't accidentally ripped anywhere. The result is an "instant" Faraday box with your equipment safely stored inside, ready for use following a nuclear war. Copper or aluminium foil can help you insulate a whole room from EMP as well. Just paper the wall, ceiling and floor with metal foil. Ideally the floor is then covered with a false floor of wood or with heavy carpeting to insulate everything and everyone inside from the shield (and EMP). The only catch to this is that care must be taken NOT to allow electrical wiring connections to pierce the foil shield (i.e., no AC powered equipment or radio antennas can come into the room from outside). Care must also be taken that the door is covered with foil AND electrically connected to the shield with a wire and screws or some similar set up. Many government civil defence shelters are now said to have gotten the Faraday box, "foil" treatment. These shelters are covered inside with metal foil and have metal screens which cover all air vents and are connected to the metal foil. Some of these shelters probably make use of new optical fibre systems—protected by plastic pipe—to "connect" communications gear inside the room to the "outside world" without creating a conduit for EMP energy to enter the shelter. Another "myth" that seems to have grown up with information on EMP is that nearly all cars and trucks would be "knocked out" by EMP. This seems logical, but is one of those cases where "real world" experiments contradict theoretical answers and I'm afraid this is the case with cars and EMP. According to sources working at Oak Ridge National Laboratory, cars have proven to be resistant to EMP in actual tests using nuclear weapons as well as during more recent tests (with newer cars) with the US Military's EMP simulators. Although Faraday boxes are generally made so that what is inside doesn't touch the box's outer metal shield (and this is especially important for the do-it-yourself since it is easy to inadvertently ground the Faraday box—say by putting the box on metal shelving sitting on a concrete floor), in the case of the car the "grounded" wiring is grounded only to the battery. In practice, the entire system is not grounded in the traditional electrical wiring sense of actually making contact to the earth at some point in its circuitry. Rather the car is sitting on insulators made of rubber. The bottom line is that all vehicles probably won't be knocked out by EMP. But the prudent survivalist should make a few contingency plans "just in case" his car (and other electrical equipment) does not survive the effects of EMP. Discovering that you have one of the few cars knocked out would not be a good way to start the onset of terrorist attack or nuclear war. Most susceptible to EMP damage would be cars with a lot of IC circuits or other "computers" to control essential changes in the engine. The very prudent may wish to buy spare electronic ignition parts and keep them a car truck (perhaps inside a Faraday box). But it seems probable that many vehicles WILL be working following the start of a nuclear war even if no precautions have been taken with them. One area of concern are explosives connected to electrical discharge wiring or designed to be set off by other electric devices. These might be set off by an EMP surge. While most citizens don't have access to such equipment, claymore mines and other explosives would be very dangerous to be around at the start of a nuclear box if they weren't carefully stored away in a Faraday box. Ammunition, mines, grenades and the like in large quantities might be prone to damage or explosion by EMP, but in general aren't all that sensitive to EMP. Provided you're not next door to a nuclear power plant, most of the ill effects of EMP can be overcome. EMP, like nuclear blasts and fallout, can be survived if you have the know how and take a few precautions before hand. And that would be worth a lot, wouldn't it? Some initial thoughts on EMP protection from the US military packaging division. A continuously sealed metal barrier has proven to be very effective in preventing EM/HPM energy from reaching susceptible electronic or explosive components. Exterior packaging fabricated from plastic, wood or other fibre materials provides almost no protection form EM/HPM threats. The metal enclosure can be very thin provided there are no openings (tears, pin holes, doors, incomplete seams) that would allow microwaves to enter. Sealed barrier bags that incorporate a thin layer of aluminium foil and are primarily used to provide water vapour proof protection to an item, can add a great deal of resistance to EM/HPM penetration. A number of cylindrical and rectangular steel containers have been developed by the Packaging Division for a wide range of munitions, weapon systems and associated components. The cylindrical containers are end opening and the rectangular containers are top opening. All the containers have synthetic rubber gaskets that allow them to maintain a +3 psi environmental seal to the outside environment. The containers are constructed using seam welding to provide for continuous metal contact on all surfaces of the body assembly. The cover openings have been held to a minimum and the sealing gaskets positioned in a manner to allow overlapping metal parts to add additional protection to these areas. Microwaves are very adept at bouncing around and working their way into even the smallest opening. Tests of the cylindrical and rectangular steel containers used by this organization have demonstrated a high level of protection in preventing EM/HPM energy from entering the container. The key is to use a metal enclosure and eliminate or minimize any openings. Where openings are needed they should be surrounded to the greatest extent possible by continuous metal and in the case of a gasket, metal sheathing or mesh can be placed around the elastometer material or conductive metal moulded into the gasket. The closer the surrounding container comes to a continuous metal skin the more protection that will be provided. High quality gaskets, utilizing either a mesh or embedded conductive metal design, are very expensive. They add a magnitude of cost to a normal gasket and can easily double the price of a container similar to the ones mentioned above.